DIAMOND BAR, CA—Diamond Bar High School is sticking with a recipe for student success that began two decades ago. Teens in Pathways Communication Academy cross-age tutoring class currently visit Maple Hill Elementary every Monday, Wednesday, and Friday. The 13 big buddies, as they are called, pair up to assist the youngsters for an hour in every grade level around the campus. “We help them with whatever they’re working on –usually it’s math, art, or reading,” said junior Alyssa Gonzalez. The elementary students light up when their buddies walk into classrooms. “My 2ndgrade students thrive on the individual attention of the high school buddies,” said teacher Theresa Rovira. Fourth grade teacher Shari Criddle shared that the tutors have become great big buddies to three of her students. “They help them read math word problems, attend music with them on Fridays, and play alongside them at recess,” she said. 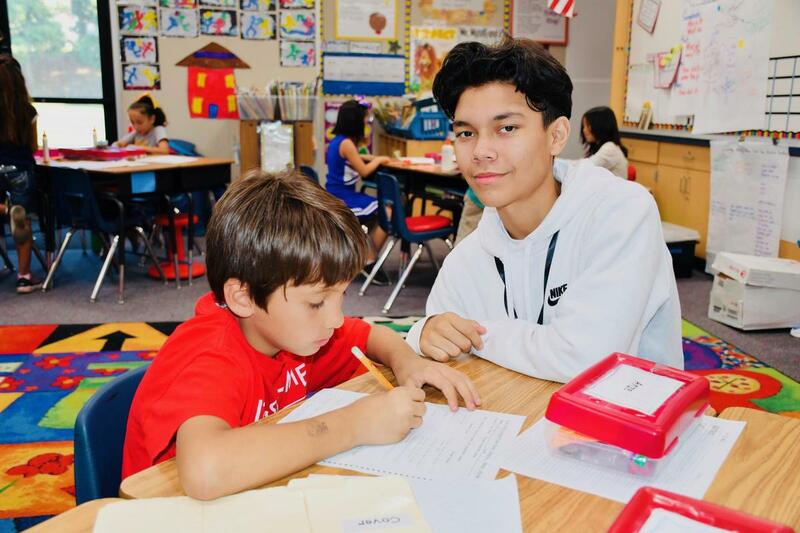 “It’s fun, I like teaching the kids a lot!” shared junior Mikey Ojeda while helping his 2ndgrade tutee, Anze, with a math assignment. The cross-age tutoring originally began in 1998 through an AmeriCorps federally-funded service program. 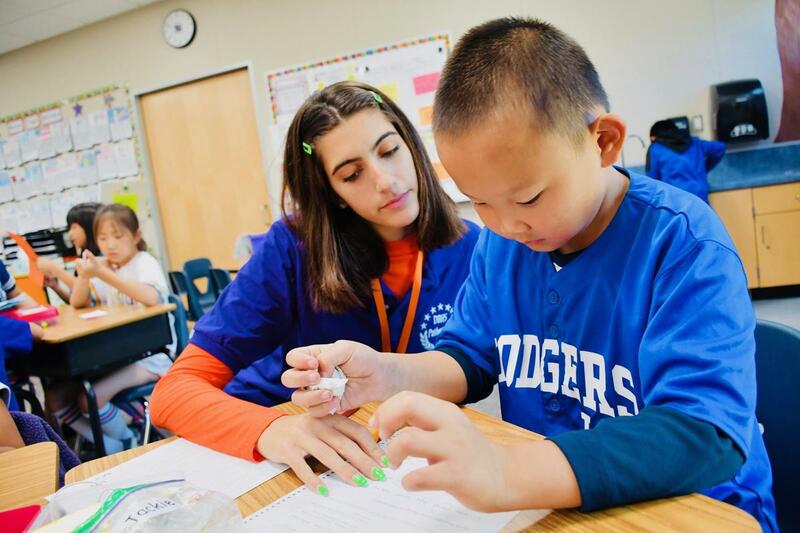 After the three-year grant ended, Diamond Bar High continued sending tutors to several Walnut Valley USD elementary schools. “It never stopped!” commented teacher Eleanor Boruah who arrives with her students at 10 a.m. on a school bus funded by the California Partnership Academy Grant. “Our kids love it, they look for their big brothers and big sisters!” said Maple Hill’s Principal, Kelly Morris. “It’s become one of our strongest combinations,” she said. The high school students know who they’re working with and what they need to do when they arrive on campus. “Last year, we started assigning kids by their characteristics and giving tutors bios about them,” Morris explained. “They feel like they’re more of an integral part of our campus – they’re invested,” she added. 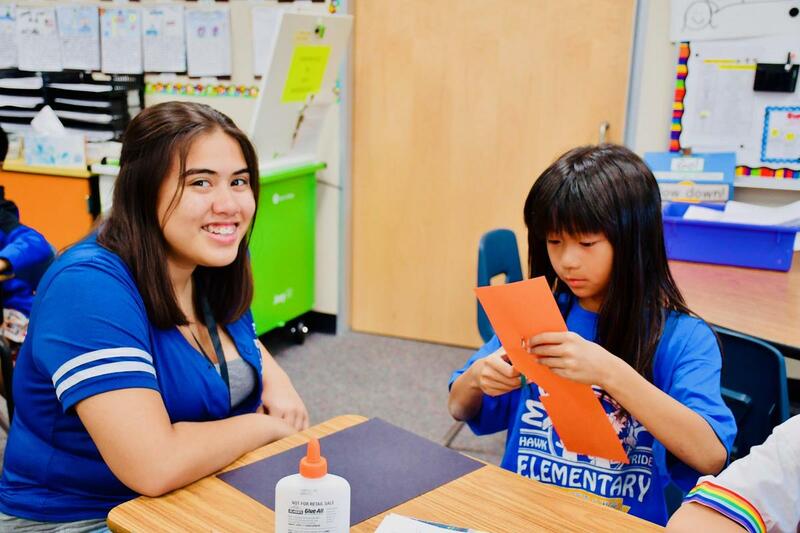 “Tutoring has taught me how relationships develop into a bond with children,” shared junior Aracelli Palmer. When the school hosted a sports day to celebrate Red Ribbon Week, the high school students also dressed for the occasion. “Maple Hill has really embraced our program!” Boruah said. 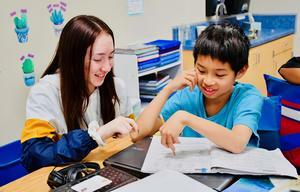 The connections built through the cross-age program have gone beyond academics, according to teachers. “One of my students is having great difficulty making friends, but she is finally learning to be a friend because of her tutor,” Criddle said. 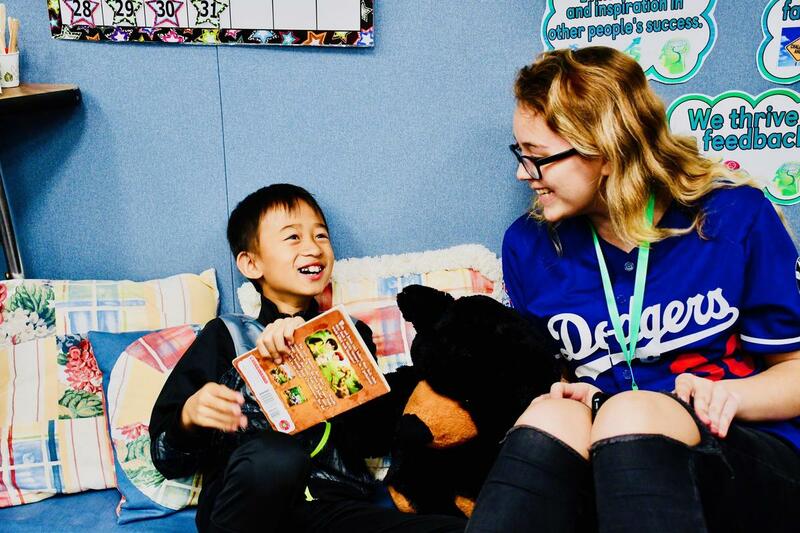 “My student, Chester, has truly enjoyed Stephanie’s (Castro) visits and has been able to foster a friendship over the last couple months,” shared 4thgrade teacher Samantha Valadez. 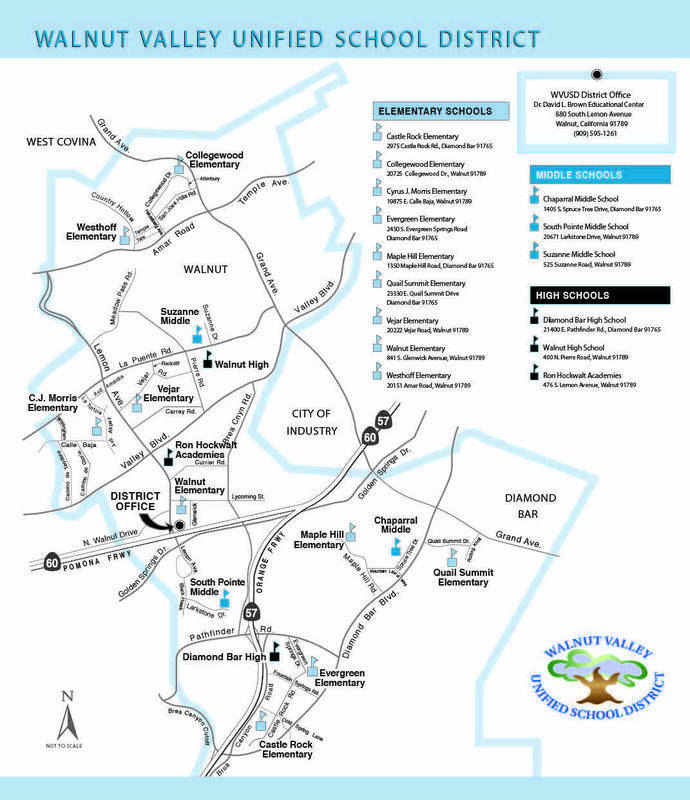 Cross-age Connections! Diamond Bar High teens tutor children at Maple Hill Elementary on October 24.